Imo Frank APK software download. For hack imo free video calls and chat app users chat history and account. Frank APK software is best and easiest way to grab your friends IMO call history. It a pure apk application for hacking imo free video calls and chat app from Android phone. Imo Prank apk is basically an Android tool. Use this app for tracking your girlfriend, wife or boyfriend almost anyone you need. 1.2 Why need to hack IMO? 1.3 Can imo video calls be hacked? 1.4 Is the app has Prank menu? 1.5 How to contact support center? 1.6 How to get the Android Version? 1.6.1 Is the app available on the google play store? 1.7 Does app has an iPhone version? 1.8 Can I install the app on Windows mobile? Click to download the apk software from our server. This server is secure to download. But we can not give a guaranty for your security for this app. So, get it on your decision. 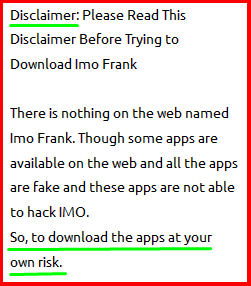 Here is some related information to download Imo Frank Apk and Install it to hack imo app. Every asking has a good answer. The App developer answers you all the questions about prank app, hacking, downloading and installing. All-everything you need. Alos there is a method to Imo app free install. Why need to hack IMO? There is two aim for this. One of them is Blackmailing and the second hand is just funning or learning purpose*1. Please do not use it for any kinds of harmful aim. Sometimes we need to resist the enemy. Or need to learning something. So, we need to hack IMO. Can imo video calls be hacked? Hack Imo IM only using SIM number. It is only for making funny moments for your friend. Make yourself a hacker on your friend community! But the reality is that you are not a hacker; you are just a patcher 🙂 Install Frank IMO and follow the steps below. Is the app has Prank menu? Yes! This brings out a beautiful menu bar to doing or starting any operation for hacking. The menu helps you for taking actions instantly. Go to any menu instantly by clicking on the items. As a result, it is helpful for Frank navigating help. How to contact support center? Yes, you can contact support center at any moment. Find the “Send a message” link on the navigating bar. Tap the link and write your message. Give a subject and write your email, Name etc. Finally, submit your message. It is especially related to improving our user experience. Maybe it is the way to taking the decision to upgrade the for next. How to get the Android Version? Android version means the APK version. Download the APK version from our server. The Android is the most wonderful smartphone of all. AppsnChat shares all kinds of messenger related apps. Keep your eye on the home page of our website for the daily minimum for once. Is the app available on the google play store? No, due to the policy of the play store, they don’t accept our app to share on the Android store. As a result, we use the third-party apps sharing website. Please download the app from this website. Does app has an iPhone version? Extremely sorry, No, this app has not an iPhone version yet. But the developer is now starting the working to quickly develop a new and free app for iPhone users. Can I install the app on Windows mobile? Windows mobile is the now getting popularity. Due to lack of windows Imo user, Yet not. Though we are not developed the app for windows mobile. But within few days, it will release on the web. Please wait for few months. It will release on the various 3rd party app sharing website. Because the authority app sharing websites is not accepted this app to upload their server for hacking related matters. 1Note Book: We build up this app for only learning purpose. Please do not use this app for blackmailing anyone. The App developer and tips/article writing are not responsible for any unnatural activities. Download Imo Frank App at your own risk. In this para, I will write something about like a tutorial for how to use the app on Android for hack imo user’s account. Please patient, we starting experiment already! It maybe takes minimum 15 days. Within the March 2018; we will release the case study for the application. So stay with us and keep your eye on this guide. Imo prank APK software is free for download from our website. But if you the app will harm you; we can not responsible for the occurrence. Download and install it at your own risk. Maybe such kinds of apps are harmful to privacy. We say once again: Please do not hack imo to blackmail anybody. I’m downloading now to test it. plz give me imo frank link …….jamil hassan … amar gf er jonno lagbe …. plz link ta den …plz .. I download this and it is fine! I need frank for hack my girlfriend’s imo app. I need this link plz….. I need hack my wife imo becouse I leave in forain country. I need hack my gf imo becouse I leave in forain country. i need to hack my wife..
bro give me a imo frank link please. Boss, you are joss sharing! I hack my wife’s imo. ..
Please…. .. i am a big trouble. .. please save me..
amr husband k cheak korar jonno onk proyojon…..😞 baire take kar ste ki kre ta jana knk proyojon amr link ta kub dorker…..
Vondo to tui, onno loker imo hack korar try kortasos. Tui to ek number chor. manuser imo hack korar rights to ke, ke diyese? Article ta ar ak bar bhalo kore por. And, disclaimar section ta o dek. tar por bujbi oi khane ki leka ase. Tui to ak number madon. Imo er moto ato large ekti chatting app kew hack korte pare ki? tui to ekta ak number bolod. MY NEED IMO FRANK APP. Bro please please please my need imo frank. please give me a link please please..